The jellyfish has been the subject of numerous mathematical and physical studies ranging from the discovery of reentry phenomenon in electrophysiology to the development of axisymmetric methods for solving fluid-structure interaction problems. In the area of biologically inspired design, the jellyfish serves as a simple case study for understanding the fluid dynamics of unsteady propulsion with the goal of improving the design of underwater vehicles. In addition to locomotion, the study of jellyfish fluid dynamics could also lead to innovations in the design of filtration and sensing systems since an additional purpose of bell pulsations is to bring fluid to the organism for the purposes of feeding and nutrient exchange. The upside-down jellyfish, Cassiopea spp., is particularly well suited for feeding studies since it spends most of its time resting on the seafloor with its oral arms extended upward, pulsing to generate currents used for feeding and waste removal. In this paper, experimental measurements of the bulk flow fields generated by these organisms as well as the results from supporting numerical simulations are reviewed. 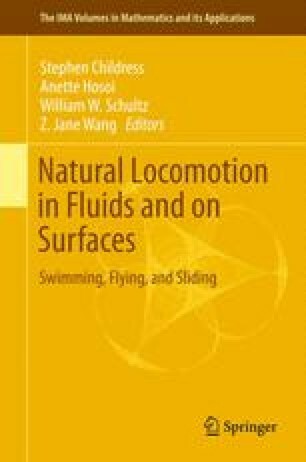 Contraction, expansion, and pause times over the course of many contraction cycles are reported, and the effects of these parameters on the resulting fluid dynamics are explored. Of particular interest is the length of the rest period between the completion of bell expansion and the contraction of the next cycle. This component of the pulse cycle can be modeled as a Markov process. The discrete time Markov chain model can then be used to simulate cycle times using the distributions found empirically. Numerical simulations are used to explore the effects of the pulse characteristics on the fluid flow generated by the jellyfish. Preliminary results suggest that pause times have significant implications for the efficiency of particle capture and exchange.